The past few weeks, I took a break from historical fiction and returned to Amish fiction. 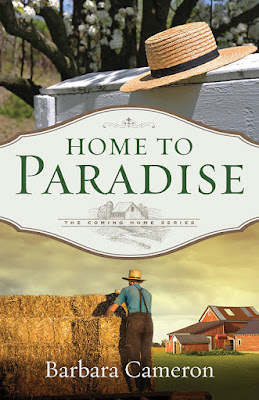 I had the chance to read Home To Paradise by Barbara Cameron. It was the first book that I have read by her and the last book in The Coming Home Series. The book was an enjoyable story with nice characters. I liked the dual perspectives, the chance to really get to know what Rose Anna and John were experiencing as well as their thoughts around it. The characters were real people and had real struggles - Rose Anna with her expectations of a future with John and a need to find a way to win him back to her and the community and John with his struggles with his father and trying to find his place in the world. This story of coming home allowed us to watch the characters make decisions that were not always easy or simple. Compared to many other books that I have read, there was a lot more interaction with Englischers in this story, such as volunteering at a Woman's shelter, teaching classes at the local fabric store and working on an Englischer's farm. It was a good book, but seemed to be a slower moving book which is probably an okay thing in the fast moving world in which we live. It would be interesting to learn more of the back stories, but the book functioned well as a stand alone story and nothing was lost by not reading the earlier books in the series.